There are two rooms available for hire at Penistone Leisure Centre – the Main Hall and the Party Room (the smaller room on the front of the building). We have suggested some things you might want to book the hall for below, but give us a ring if you have other ideas too. See our Parties page for booking a party. This includes any hire of rackets and shuttlecocks, if needed. We have two fantastic quality tables, available to hire! This includes any hire of bats and balls, if needed. Table tennis is available every Saturday morning from 9am-12noon, and at other times around classes etc. The Main Hall can be hired for Cricket at £25 per hour. The Main Hall can be hired for 5-a-side football at £25 per hour. 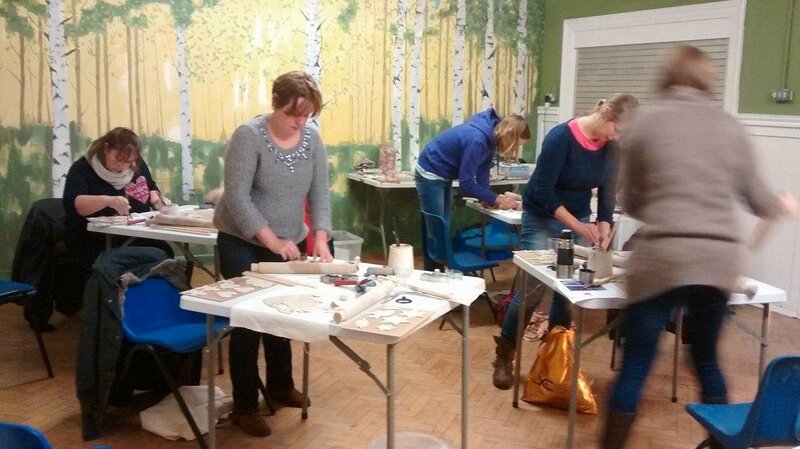 The party room can be hired for running workshops like Sarah Jones Morris Ceramics at £10 per hour. Basic rental costs are £20 per hour at peak times and £15 per hour off peak. Or you can opt to pay us £2 per client who attends your class. We can be flexible about payments while your class builds up numbers. It will depend on whether we have a party booked. You could play after 8:30pm as parties will have finished by then, or you could book in for table tennis if we don’t have a party booking 2 weeks in advance of the date. You can also play between 9am-12 Saturday mornings. Please contact Kirsty for more info or to book this on 07341 300259. I am looking for a venue to teach SOSA Dance from April 2019. Do you have any availability day or evening or weekend please? Yes we do have some availability you need to talk to Louise who is in on Friday – call/ text her on 07526 753100 or email [email protected] and I’ll also pass your email address on to her. We are looking to hire space for our On Broadway dance classes a morning 9:45/10:45am? and also an evening 7pm. Could you let me know if you have availability for this to be regular and what days this might be. Someone will be in touch on email. Is the hall available to hire on Sunday 26th November? I play ball hockey and normally train at Rotherham Simply Skate once a week, but I really wouldn’t mind being able to practice in a local sports hall. How much would you say you’d be willing to rent the hall out for per hour? There would only be two of us and in fact we’d perhaps only need half of the hall just to practice some drills. You could hire the hall out for £10/hr, the same as badminton. Please let me know when you were thinking of coming so I can look at availability.